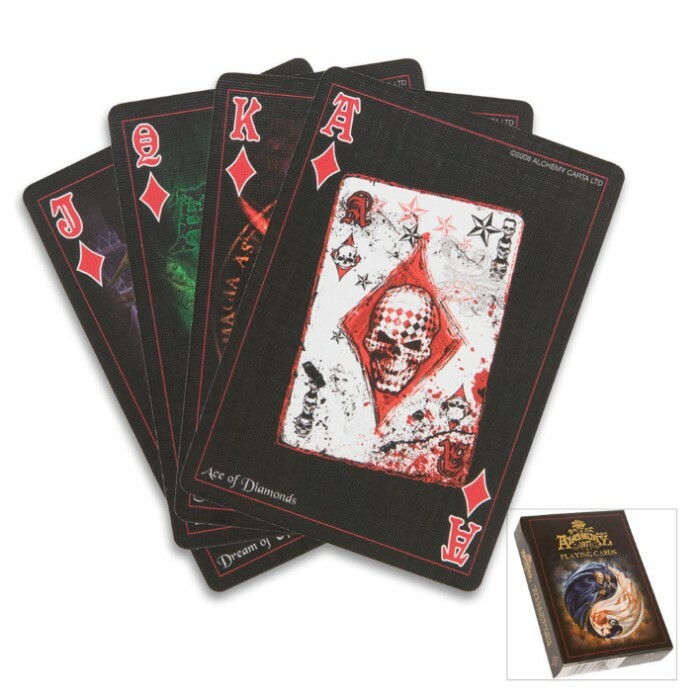 This Official Poker size playing card deck features 52 full-color images of supernatural myth and Gothic fantasy from the classic archives of Alchemy. You'll never want to stop playing with these mystical cards! I didn't buy this deck of cards for art but to help in surviving the Zombie outbreak thatâ€™s coming and I was a little disappointed because the cards only gave general hints of how to survive. I wanted to know how to set traps for them in graveyards (Zombies are good at climbing out of deep holes) and how to stop them from multiplying (Zombies run in hoards) but the survival cards didn't go into much detail, just general stuff, I mean, we all know that head shots are best to stop a Zombie that's staggering up to you.....duh! I love the cards. that's all there is to it. they came in their own box, and each image was printed clearly, with the title of the picture, and the finish had a nice feel to it for shuffling and stacking. Simply amazing, breath taking artwork on every card! I love em! Very distinct images and each card is different. Bought these for poker but cant even allow myself to use them because of how unique they are so I will have to wait til I purchase another pack and an additional one for my girl who is now envious. Thanks trueswords! I bought these just for the artwork. I'm very happy I did. Great artwork.